"If you come across a video or photo of a pet slow loris on the internet, please know that, while it may appear cute, the animal in the video is suffering." 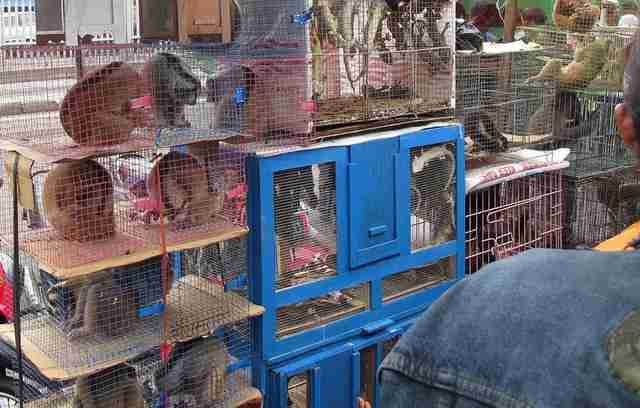 This is what the illegal pet trade looks like. Photos recently shared by International Animal Rescue (IAR) show what life is like for slow lorises - small, doll-like animals known for their cuddly appearance - who are captured from the wild to be sold as pets. 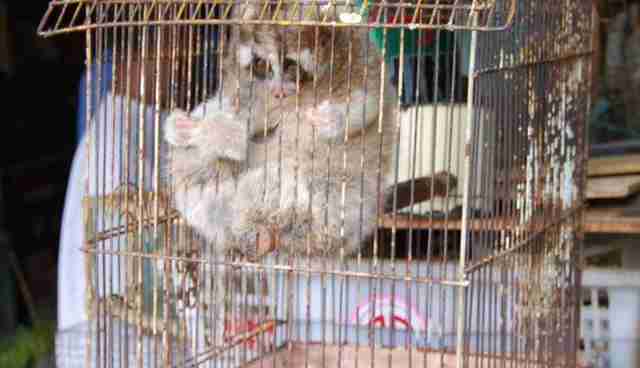 In one image, a tiny loris hunches over in his barren wire cage, his little hands wrapped pleadingly around the bars. In others, dozens of animals can be seen stacked in tiny wire cages on the street, all curled up or hunched over, with no room to sit upright, let along climb as they would in the wild. The pictures are heartbreaking, but IAR hopes that sharing them will make people realize just how much harm goes into making these "cute" animals into household pets. 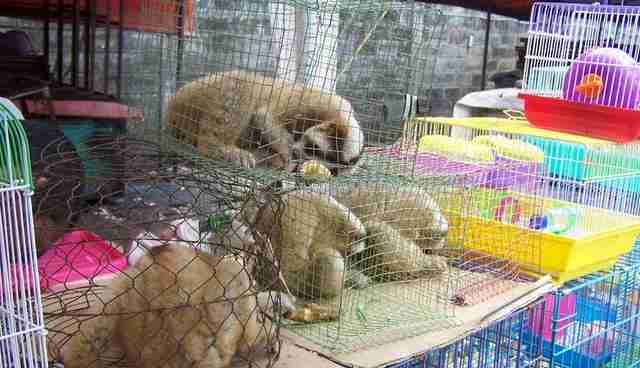 "The slow loris pet trade involves horrific cruelty and suffering," IAR said in a Facebook post. 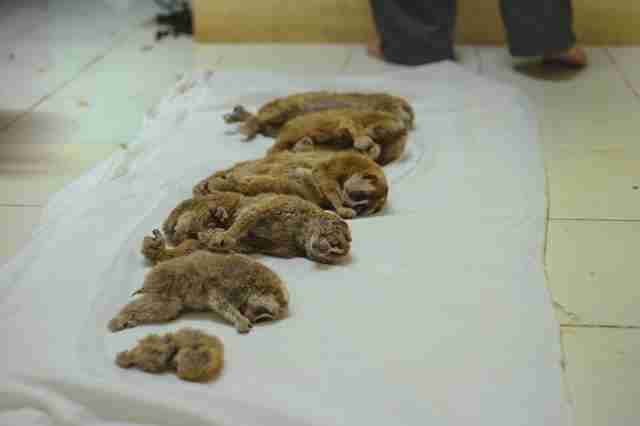 "Every single day, three slow lorises are poached from the wild," the group noted. "Of these, an average of one dies." One species, the Javan slow loris, is already critically endangered, largely due to the exotic pet trade. Surprisingly, there's one very simple way people around the world can help save them. According to IAR, the demand for slow lorises is closely tied to several popular viral videos that show slow lorises living in people's homes and, in some cases, being "tickled" - which makes the little animals raise their arms over their heads as if they're enjoying it. Unfortunately, the truth behind the videos isn't as cute. The lorises are often violently seized from their forest homes - as their names indicate, they're too slow to run away - and are stuffed into bags to be transported. They are often fed inappropriate diets, develop bone or metabolic disorders, and are unable to engage in their natural nocturnal behaviors. Slow lorises also have venom glands in their elbows that they use as a means of defense, raising their arms and licking the spot before biting. But after lorises are taken from the wild, they often have their teeth cruelly ripped or clipped out - a painful procedure that's performed without anesthetic - to make them more doll-like and stop them from biting their new owners. In short, the "tickling" videos show lorises raising their arms to try to defend themselves from their owners, not engaged in play. And even when tickling isn't shown, the popular videos of the cute animals are largely fueling the pet trade, according to IAR, which has launched a campaign called Tickling is Torture to raise awareness about the little animals' plight. So that one simple thing that can help save the slow loris? Don't share videos or photos that show slow lorises as pets. "If you come across a video or photo of a pet slow loris on the internet, please know that, while it may appear cute, the animal in the video is suffering," IAR wrote on its website, decrying the "online craze" that has contributed to the species' decline. "Not only does the slow loris pet trade cause unimaginable suffering, it is also the biggest threat to the survival of the species, which is in serious danger of extinction." Want to help save the slow loris? Click here to sign a pledge promising not to support the exotic pet trade. You can also make a donation to IAR, which runs the only slow loris rescue center in Indonesia, where the slow loris is most at risk.